I'm a late bloomer with arugula (also called rocket). I didn't actually discover this "baby green" until I was well into adulthood. I grew up in Singapore back in the 70's/80's (gosh, I sound old!) and while I had eaten plenty of salads, I had never had one with arugula in it. I don't even think arugula was common in Southeast Asia back then. It was only when I migrated to the U.S., and after years of eating just plain garden salads or Caesar salads, did I finally try a spring salad with arugula in it. And that's how my love story with this peppery leaf began. Arugula is actually an annual plant that is supposedly very easy to grow. Unfortunately for me, I have a very black thumb so due to this, I'm better off buying them in a bag from the grocery store. It is considered to be a leafy green or an herb as I've most often seen them in spring or herb salads. I've also seen them in specialty sandwiches and sometimes in pasta. It has a unique and strong flavor and when eaten alone, can taste quite bitter. However, when eaten with other ingredients, its bitterness becomes more muted and it adds a nice depth of flavor to salads and sandwiches. Some people can't get enough of cilanto. I can't get enough of arugula. 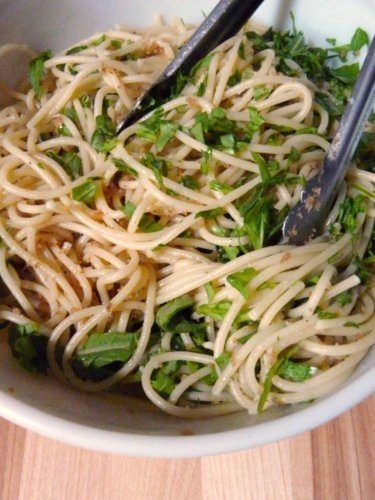 Recently, the L.A. Times published a recipe for Spaghetti with Arugula and Garlic Bread Crumbs. 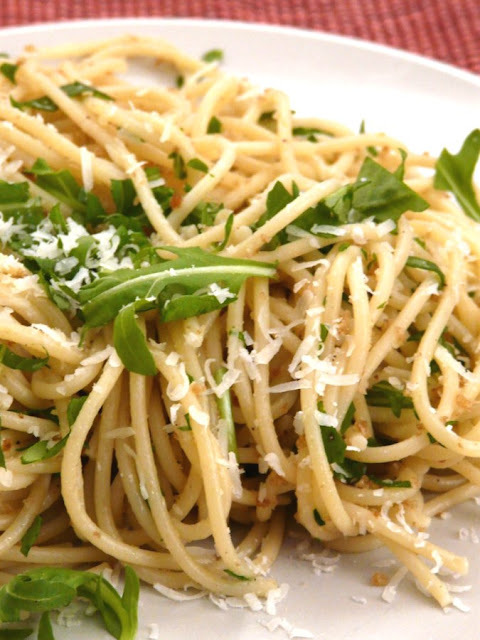 Since I haven't eaten a warm pasta dish with arugula in it yet, I thought this would be great recipe for me to try. The original recipe directs you to use a piece of garlic to flavor the breadcrumbs and then discard it. I chose not to do that, opting to mince the garlic instead and then adding it to the breadcrumbs. Garlic rules in my book and should never be removed from any dish. Recipe from the Los Angeles Times, adapted slightly. How to make garlic bread crumbs: Start with crustless bread, pulse in the food processor then toast in the pan with olive oil and minced garlic until brown. 1. 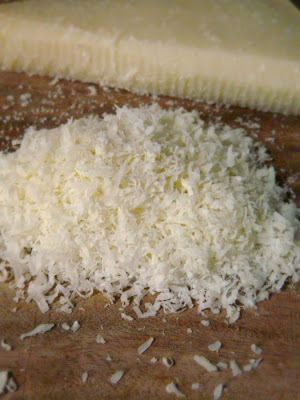 To make fresh bread crumbs, trim the crusts off the bread slices and place in a food processor. Pulse until fine. 2. Heat 2 tablespoons of olive oil in a pan over medium heat. Add the minced garlic and then saute lightly, making sure the garlic does not brown. Add the bread crumbs to the pan and then season with a pinch of salt. Cook, stirring constantly, until the crumbs have darkened and toasted, about 5 minutes. Transfer them to a small bowl and set them aside to cool slightly. 3. Cook the spaghetti in a large pot of liberally salted, rapidly boiling water. When it is tender but still slightly chewy, drain it and combine it in a mixing bowl with 2 tablespoons olive oil and the chopped arugula. Add the toasted bread crumbs and toss to coat well. 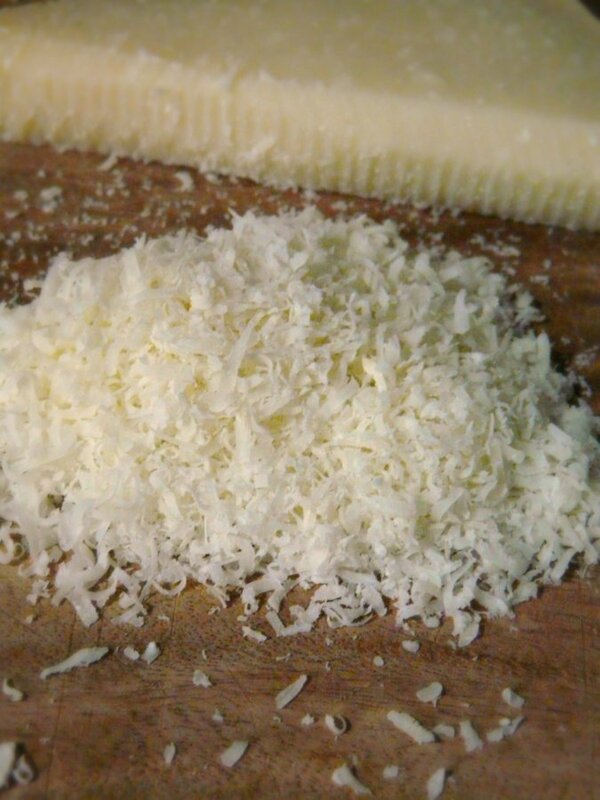 Top with the grated cheese. Give everything a good toss! What an elegant dish...! So simple yet sounds so delicious and not to mention beautiful too...!